A bright star, a planet, various kinds of nebulae in space, and a word about the birth and death of stars. View larger. | In this photo, the yellowish star is Antares. Surrounding it is a cloud of Antares’ own making … and, beyond that, vast interstellar clouds. The brightest object here is Saturn (see chart below). Photo by Navaneeth Unnikrishnan. Visit Navaneeth on Facebook. A total exposure of 24 minutes, 3 mins x 7 images stack. 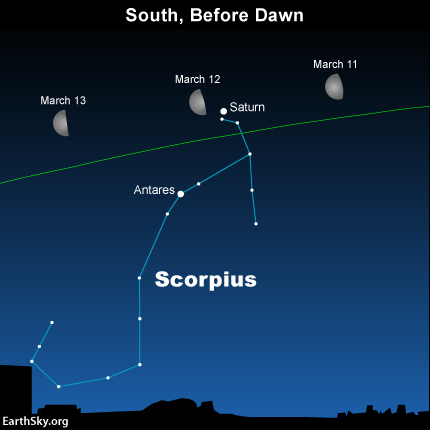 If you’re an early riser, use the waning moon to locate the planet Saturn and the star Antares for several mornings, centered on March 12. In Navaneeth’s photo, you’re seeing examples of both star birth and star death. The star Antares – brightest star in the constellation Scorpius – is the yellowish star in this photo. Antares is a giant star, near the end of its life, located some 600 light-years away. If Antares replaced our sun in the solar system, its outer surface would extend beyond the orbit of Mars. This aging star will eventually explode as a supernova. At present, tiny smoke-like particles, made from traces of heavier elements formed inside the star, are drifting away from Antares’ surface, reflecting this star’s yellowish light. That’s why a wispy nebula seems to surround Antares. Read more about Antares. Meanwhile, in the vast space between the constellations Scorpius and neighboring Ophiuchus, there is a huge dusty region containing many spectacular interstellar nebulae – places where new stars are born. 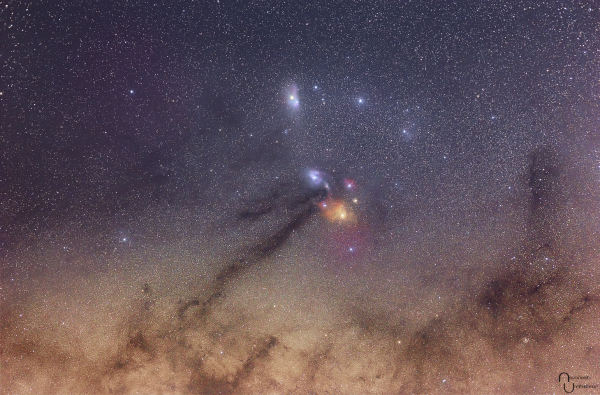 The dark streaks in this photo are part of the Rho Ophiuchi cloud complex, a huge, cool cloud of dust and gas. The region appears dark because the dust hides the light of background stars. Read more about Antares and the Rho Ophiuchi dark cloud. Bottom line: The bright star Antares, planet Saturn, various kinds of nebulae in space, and a word about the birth and death of stars. Photo by Navaneeth Unnikrishnan from Kasargod, Kerala, India.